Flying Cow Farm began just north of Winters, California on fields growing monoculture crops of barley, corn and wheat. There were many challenges to overcome in the early days – no water wells, no electricity, no fencing, poor soil. With hard work and perseverance it took time to produce our first meat harvest. We believe that ruminant animals should be grazed on pasture. This is what Nature has intended. Claims of “all natural, “grass fed” or “organic” talk about how cows are raised on grass… right until the end when they go to factory feedlots and are fattened on grain. This is the “finishing” process most producers don’t talk about. When ruminant animals are taken off pasture and fattened on grain diet, organic or not, they lose their stores of vitamins A and E, Conjugated Linoleic Acid and Omega-3’s, all of which are highly beneficial to humans. The amounts found in pastured animals are much higher than in feedlot animals. Choose Grass Fed & Grass Finished over organic every time! 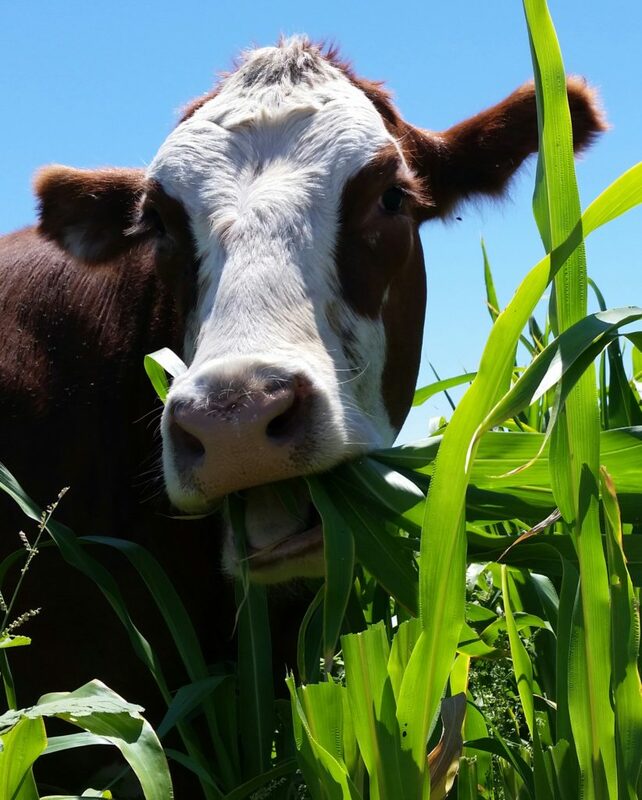 We raise our animals directly on open pasture so you can rest assured that the meat you buy from us will be 100% Grass Fed & Grass Finished Beef. Taste our meat and see for yourself what you’ve been missing! Most beef is harvested and then immediately cut & wrapped in vacuum sealed bags. This method is called Wet Aging. The aging of the meat takes place during transport to stores. Most supermarket meat is tough due to insufficient time for aging. The flavors of this kind of meat can often be metallic tasting. Our beef is hung in temperature, humidity and air flow controlled aging rooms prior to cutting. This method is called Dry Aging. It tenderizes the meat and increases complexity of beef flavor. You won’t find this kind of meat in most supermarkets. Only the finest restaurants serve steaks aged this way and now you can experience Dry Aged Beef in your own home. It’s said to have nutty and earthy flavors.